Australians are known for their ‘No worries' attitude, and that is definitely true. But over the course of my travels, there are many things that people think about Australia (or Australians) that are blatantly false. I am here to remedy the most outrageous Australian stereotypes. Cooee: it's a high-pitched call to attract attention or simply just to see how good the echo is. You'll only hear someone use it if you're going caving or trekking through a valley. Bogan: someone from the country or small town that's a bit close-minded. They don't get out often. Chuck a sicky: no it's not a type of projectile. It's pretending to be sick to get a day off work – a normal occurrence to get a long weekend. Budgie smugglers: these should have been banned from coming into the country. They're the tiniest of bathers for men, an itsy-bitsy-teeny-weeny-nightmare-speedo-mankini. Thongs: sorry to burst your bubble, but this is the more common word for flip flops or sandals. Jumper: no, it's not a mode of transport involving a kangaroo. It's a sweater, or a pullover. I've included some of the hilarious questions and answers from the Australian Tourism Board throughout this post, as they're too good not to share. Crocodile Dundee is a legend! Australia is just an island, how big can it be? 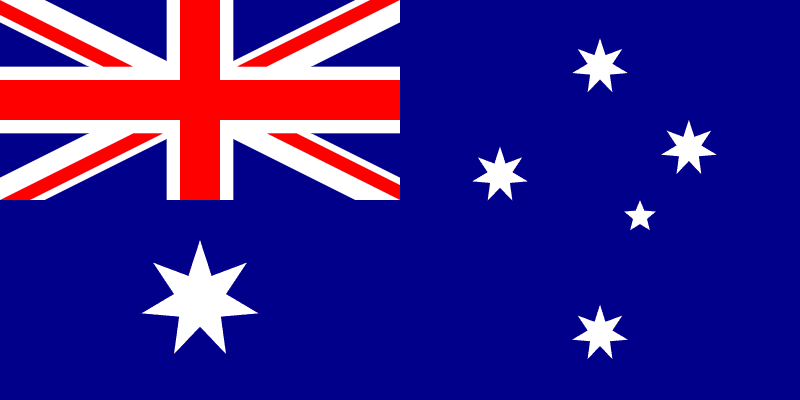 Australia is the word’s smallest continent but the world’s sixth largest country. It covers an area of 7.7 thsd square kilometres, that’s slightly smaller than the United States mainland which is 7.8 thsd square kilometres. However, 44% of Australia is desert and a further 37% is semi-arid grassland or shrub communities. So we mainly live along the coasts, thus why you see most photos related to Australia at a beach. ‘Do you ride kangaroos to school? Where do you park them?' Back in the 90's when my parents took me on my first trip overseas to the US, this is one of the first questions I was asked, along with ‘do you have phone lines?'. Kangaroos and koalas rarely come into the cities, but if you venture inland to the country communities you should be able to find some. Just don't try to pat them. 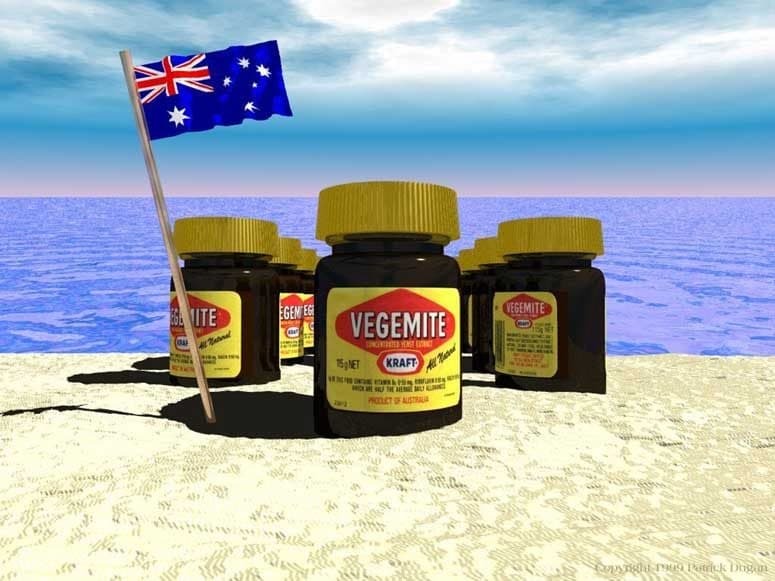 A lot of Australians (like others around the world) detest Vegemite. It is an acquired taste, to say the least, and is usually spread very thinly on hot buttered toast for breakfast. Tim Tams are the preferred treat of every Aussie household, chocolate coated chocolate biscuits with chocolate cream in the middle – you can't get much better than that! Deadly animals is another Aussie stereotype. Many of the world's most venomous snakes are found in Australia, and one of the most dangerous spiders in the world, the funnel-web, is commonly found in Sydney homes. With technology in anti-venoms and treatments, it is rare to die from a snake or spider bite in Australia. The north of Australia is home to the world’s largest species of crocodile, the salt water crocodile. Males can occasionally grow to lengths of over 6 metres, big enough to swallow anyone whole! 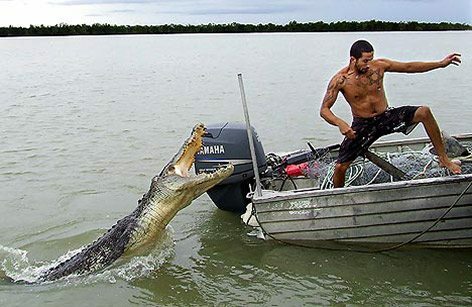 Each year one or two people are eaten by crocodiles in Australia. You can greatly reduce your risk of being eaten by not camping next to an enclosed riverbank that has a sign saying, ‘Warning: Crocodiles'. Sydney is the capital, or maybe it's Melbourne? Neither actually. Sydney and Melbourne are Australia's largest cities but they couldn't decide who was bigger and better, so they compromised on a smaller city in between and created Canberra. Instead of everyone being trained for the army, we all have to go through a gruelling Baywatch-style life-saving program at the beach. Ok, that's a wish not a fact. A couple of months ago we wrote a post on Canadian Stereotypes. It was a lot of fun to share our views of how people perceive us. While we were writing it, we thought that it would be a great idea to have other people share their stereotypes and misconceptions about the country that they call home. Lauren and Todd of Globetrooper, (an amazing website where people can find travel partners or join existing trips) were kind enough to be our first guest writers on the subject Thanks to these two awesome Aussies who shared their most outrageous Australian Stereotypes and misconceptions with us. 45 Responses to "G’Day! Outrageous Australian Stereotypes Debunked"
can people get any more stupid. riding on kangaroos? seriously? Great series idea. I was born and raised in Alaska. I didn’t have to leave the country to get asked stupid questions. In fact, last week I was planning my road trip home to Alaska and a co-worker (a software engineering manager) said “you can’t drive to alaska; can you?”. Yep…I just told him that I’d ignore he ever asked me that. Cute post! 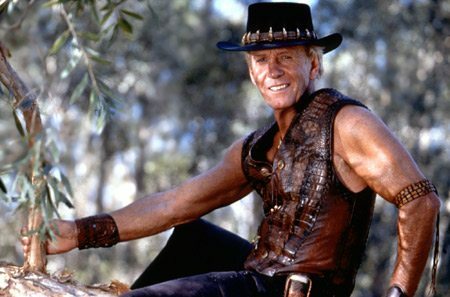 I think Crocodile Dundee is the culprit in spreading Australian stereotypes. It’s a fun movie but makes the country look like a total backwater! Yep, I was def disappointed to find out some of the things on this list. Oh well. .-= Brooke, WhyGo Australia´s last blog ..Iconic Aussie Food- Lamingtons &amp How to Make Them =-. Fun read…learned a lot, actually. Love that slang! .-= Lisa E @chickybus´s last blog ..Trippy Travel Photo 2- Guess What &amp Guess Where =-. .-= Margo´s last blog ..Visions of Barneys- Gumps and Macys Danced in their Heads =-. Haha, That is where I got all my ideas of Australia too… Men at work and their vegemite sandwiches. This post is amazing! Had a nice chuckle going on. I have to admit, most of what I knew of Australia growing up was Crocodile Dundee and kangaroos. But I mean, I live in Texas so I get really bizarre questions about life here too lol. .-= Erica´s last blog ..Hometown Tourism – Santa Rampage-Santa Con =-. .-= Merav | AllWays Car Rental NZ´s last blog ..Photo Friday- Thunder Creek Falls =-. .-= Merav | AllWays Car Rental NZ´s last blog ..Accommodation- Motel Hostel Free and the Age Old Question To Book In Advance Or Chance It =-. You guys make me smile — great, and funny, post. .-= Federico´s last blog ..Washington DC in a Day =-. .-= jamie´s last blog ..Wikileaks – A Traveller’s Thoughts =-. Or explain why the sentence: “Hi, I’m Randy and I’m rooting for you,” is hilarious to Australians. And possibly offensive to sum as well. Great post, had me laughing all the way through – I’m a bit embarressed about the guy from the UK and the rain/wind question. .-= Poi´s last blog ..Getting stuck in Tunnels! =-. So funny! I can’t wait to visit next spring for the first time! Oh No, you’ve just blown all the sterotypes away – Us Aussies won’t be able to make fun of foreigners when they visit us any more! I’ll have to get in touch with Oprah before she does her shows in Australia show that I can have her re-instate these stereotypes. .-= The Travel Tart´s last blog ..Big Five Game Drives at Phinda Private Game Reserve =-. Haha, don’t worry. Oprah’s audience will definitely believe all the stereotypes. Re dangerous animals: in the Sydney Aquarium, after walking past all kinds of interesting creatures, you’re presented with the deadliest of them all: humans. Way worse than any spider, snake, shark or croc! In Oz and everywhere else. .-= Sophie´s last blog ..Magic of Cities 2- Copenhagen =-. Cute! We’re having a ridiculously wet one at the moment in Victoria. I think people easily forget (or never bothered to find out in the first place) how big Australia is and how different it is from region to region. .-= Andrea´s last blog ..Happy Feet- One Gal’s Tennis World Tour =-. Love this, when I was in Australia it rained ALL the time. Travelling up the East Coast it poured with rain in Byron Bay, got stuck there because there were floods up to Brisbane and then I got caught in a cyclone in Airlie Beach! I’m still convinced there’s a government conspiracy to make tourists think that it’s always hot and sunny in Australia. .-= Pommie Travels´s last blog ..Getting to Belgium from London- Plane- Train or Bus =-. What!?! 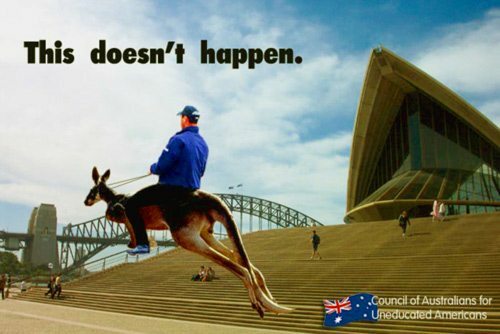 Aussies don’t ride roos to work?????? Oh, thanks for this. Brings back good memories of my high school in South Australia. .-= Jill – Jack and Jill Travel The World´s last blog ..Santa Barbara Mission – Travel California Series =-. .-= Cam´s last blog ..Photo of the Week- Giant Sand Dunes of Huacachina- Peru =-. .-= Victoria Gibson´s last blog ..Travel To India In The Pursuit Of Happiness =-. Haha love it! Oh budgie smugglers… it has to be my favourite slang. And someone at Tourism Australia has an awesome sense of humour… I like the one about hippo racing at Kings Cross… come naked :). .-= Verity´s last blog ..At home in Australia =-. It is true, we have always heard about how dangerous it is in Australia. I had visions of deadly spiders and snakes sneaking into houses and attacking people in their sleep. Haha I regularly say “g’day mate” as a greeting to others but agree that I use the others very sparingly. Check out our post about Australian Rhyming Slang if you want to get even more confused! Ooh, totally looking forward to reading that post! I will study it well before I visit Australia.